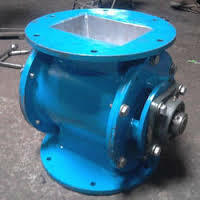 Rotary Air lock valve, As per its name this valve is locked air due to precision manufacturing of rotor and rotor body. So, all material flows freely from the bottom of the dust collector or cyclone separator. Mainly function is to prevents of produce the negative pressure in dust collector/cyclone separator and continue feed the material in hopper or collection bin.